This spectacular Lake Tahoe vacation rental is located in incredibly prestigious Incline Village with nearby private beaches, indoor-outdoor recreation center, two golf courses and ski resorts. Local fine restaurants and Nevada gambling are only minutes away! This luxury vacation rental includes 6 bedrooms, 5 full baths, 2 half baths, movie theater, family room with pool table and 65' big screen TV, HOT TUB, living room, dining room that seats 14, office and large laundry room. All rooms are decorated beautifully with a Lake Tahoe mountain theme. Incredible handmade furniture is throughout the house. All luxury towels and sheets are provided. Garage and boat parking. With over 5700 square feet, this luxury vacation home is situated on a half-acre with unobstructed Lake Tahoe views. 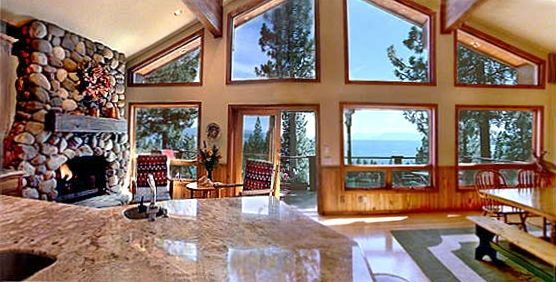 This is an incredible Lake Tahoe luxury vacation rental home! The kitchen is a cook's delight! Granite slab counters, a Garland stove, two commercial ovens, vegetable sink, wine humidor, bun warmer, and a large built-in refrigerator/freezer. A beautiful river rock fireplace completes this Lake Tahoe vacation rental kitchen. Step into this warm and cozy living room with river rock fireplace, vaulted ceiling and Lake Tahoe views. The family room has a wet bar, river rock fireplace, pool table, piano and a big screen TV. Both the living room and family room offer fabulous Lake Tahoe views. The Movie Theater has DVD and HD DVR Directv TV. Everything to make your stay at our Lake Tahoe vacation rentals one of the most pleasant experiences of a lifetime, is here for you and your family and friends. This Lake Tahoe vacation rental offers luxury and entertainment. Whether you are in town for a day or are a year-round resident, we welcome you to Lake Tahoe's finest fitness and Recreation Center. Our first-class 37,000 sq ft. complex includes an indoor pool, group fitness classes, a cardiovascular room, and a gymnasium and a complete selection of programs and equipment for you and your family to enjoy. Incline Village has two private beaches and one has a pool on the lake. California Vacation Rentals is a family owned and operated vacation rental company that manages properties in Pismo Beach, Lake Tahoe and San Francisco. We take great pride in all of our homes. You will not be disappointed with your choice of company. We chose Incline Village because of the great beaches and access to amenities. There is a large grocery store and medical services in town. The two golf courses, recreation center,Hyatt resort and Diamond Peak ski resort are within 2 miles of the house. We definitely wanted a lakeview and this house has a great one! The house is great for our family. We are able to spread out into different areas. We have a family room with pool table, living room, sitting area in the kitchen and the movie theater. We are all able to be together and get away from each other. There is an indoor pool at the Incline Village Recreation Center. In the summer time there is a pool on the beach at Burnt Cedar Beach.